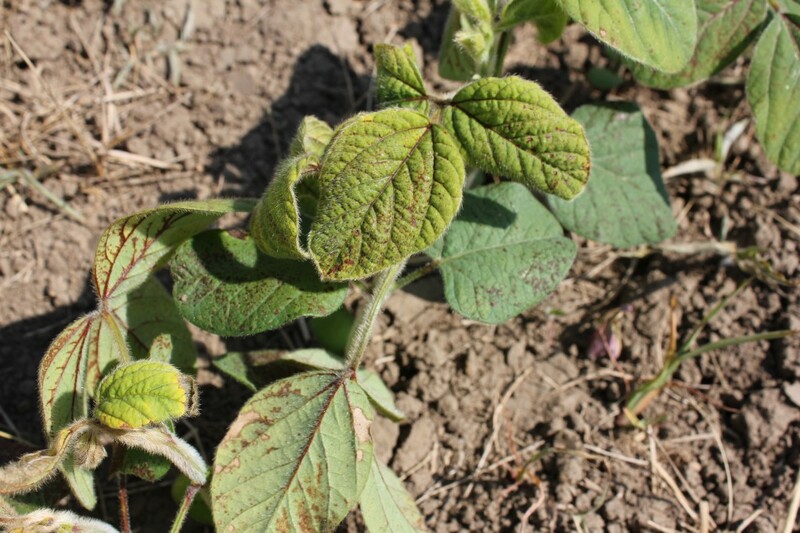 Scenario 1: Just this past spring, I had contact with a producer who had accidentally applied Guardian Plus (glyphosate + chlorimuron + flumioxazin) post emergent to his glyphosate tolerant soybeans. 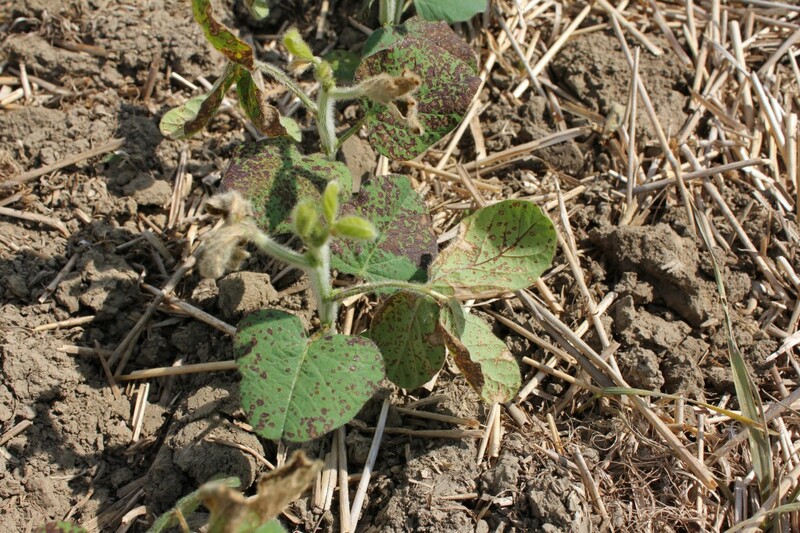 This mistake is understandable as Guardian (glyphosate + chlorimuron) can be applied both pre and post emergent to glyphosate tolerant soybeans, however the addition of the flumioxazin active ingredient (aka Valtera) in Guardian Plus causes unacceptable levels of leaf burning. The picture below were taken 7 days after application. Ultimately these soybeans will survive, as the new leaf growth is unaffected, the lower necrotic leaves, however, will fall off. Assuming that no additional stresses occur to this crop, the impact on yield is likely minimal. 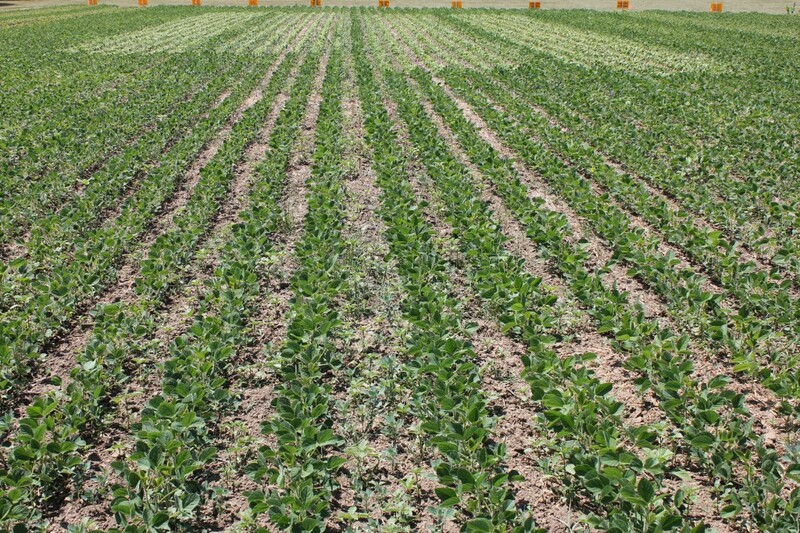 soybean stunting caused by Guardian Plus (left) compared to the two unsprayed rows to the right. Scenario 2: In 2008, I got a call from a producer who had accidentally tank-mixed Refine (tribenuron/thifensulfuron-methyl), a cereal herbicide with Cleansweep (imazethapyr+bentazon) and had applied it post emergent to soybeans. The results were not pleasant. 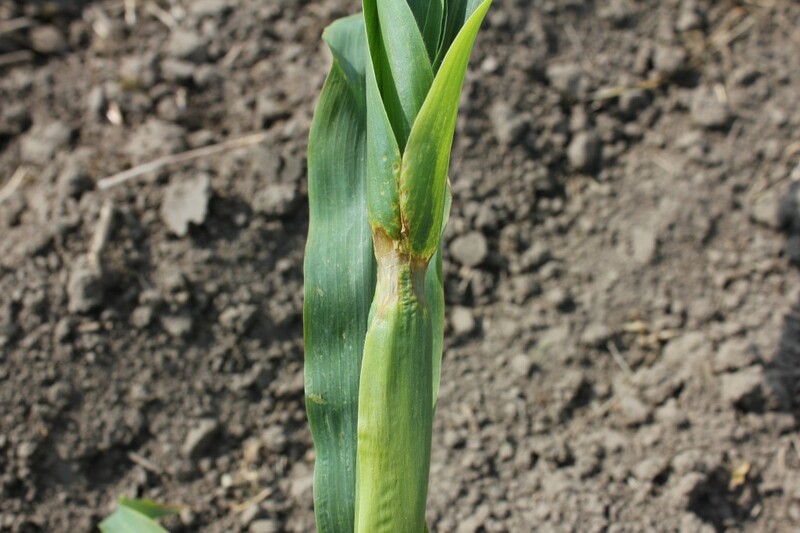 There is significant stunting, yellowing and reddening of leaf veins. The newest trifoliate growth is brown and many of the axillary buds are brown as well. This would indicate probability of complete stand survival is small and that significant reductions in yield will be observed. Stunting, yellowing and reddening of leaf veins caused by sulphonylurea herbicides, in this instance tribenuron/thifensulfuron (Refine SG) which is not registered for use in soybeans. Scenario 3: This example below demonstrates that it doesn’t matter how effective a herbicide is on a certain plant, if there is no moisture for activation it will not work. 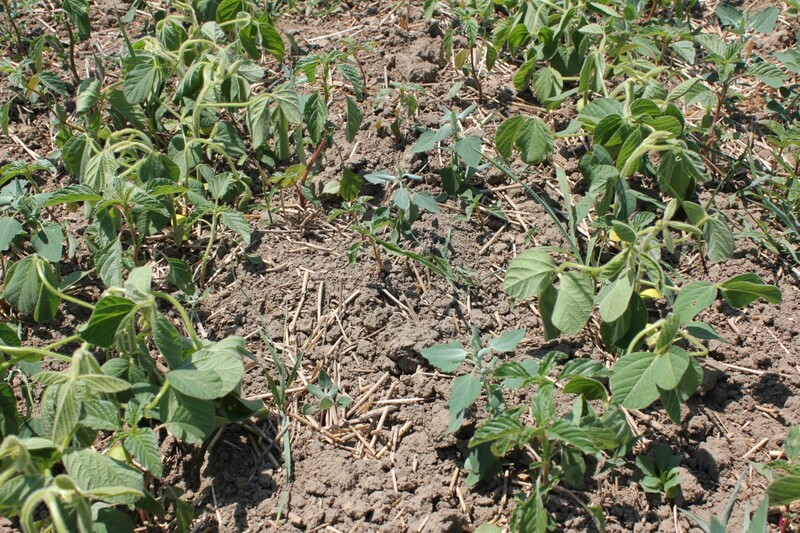 Four different herbicides (known as growth regulators, WSSA group 4) were applied pre-plant to demonstrate the relative sensitivity of soybean to each active ingredient. 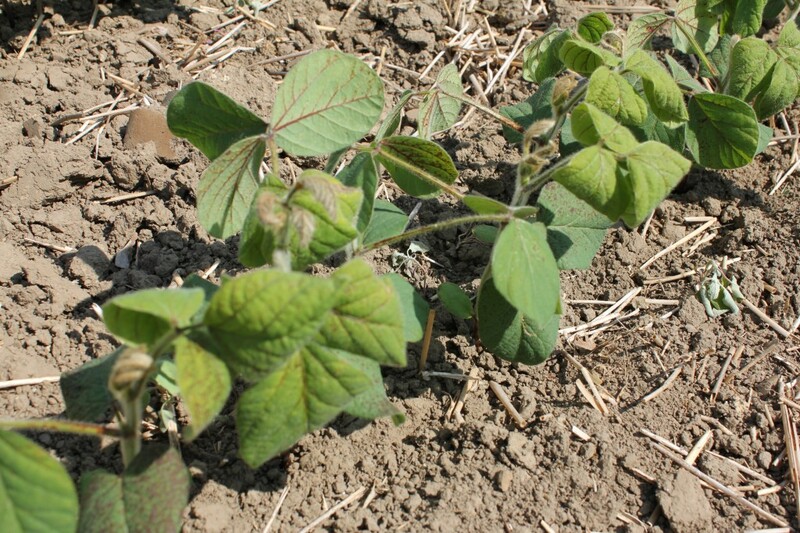 In general, University of Guelph research, along with field experience has shown that soybeans require the following interval following an application of the following herbicides in order to survive with minimal injury. So by all reasonable expectations, if you apply Lontrel prior to planting soybeans, you will kill soybeans. We have demonstrated this time and time again. 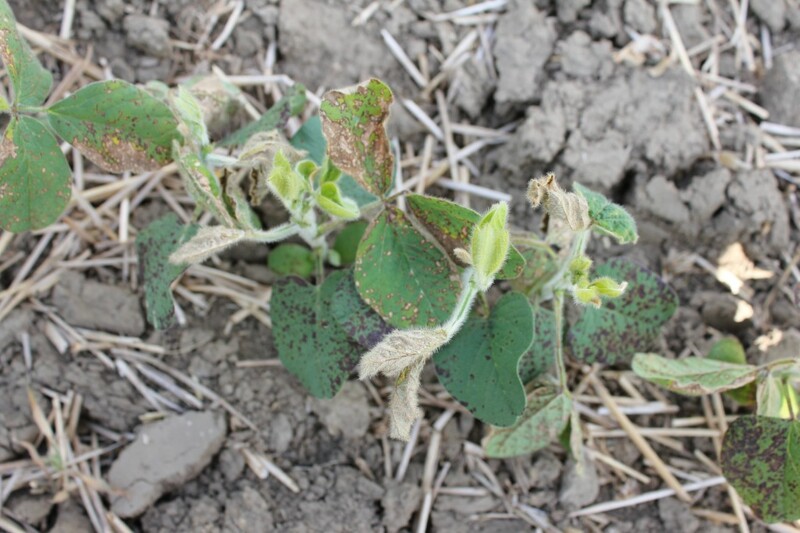 However, in 2012, there was no precipitation from the time of application to the time the picture below was taken (4 weeks later) and there has been zero injury observed with either Lontrel, Banvel II or MCPA, three herbicides that typically will cause unacceptable levels of injury. To demonstrate how injurious all four of these active ingredients can be, I went in and applied each one in a small postemergent strip, three days prior to the picture below being taken. 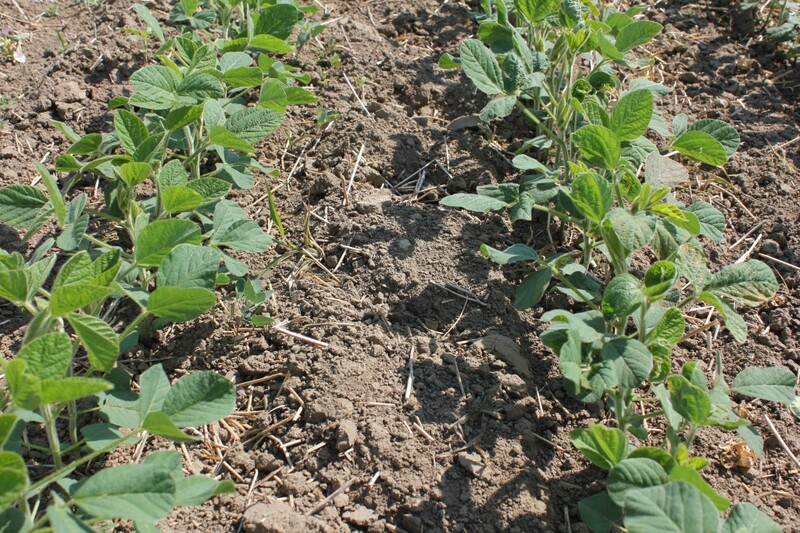 Soil conditions are still brutally dry, but I would anticipate that once a significant rainfall event occurred thereby incorporating these herbicides into the soil, that the soybean roots will take up product and injury will occur. I will follow up with this demonstration site, throughout the summer. From left to right and at the back. Post emergent applications of Lontrel, Banvel II, MCPA and 2,4-D ester. Contrast that to the front where the same four herbicides were applied pre-emergent, but due to no precipitation since application, no injury or weed control has been observed. 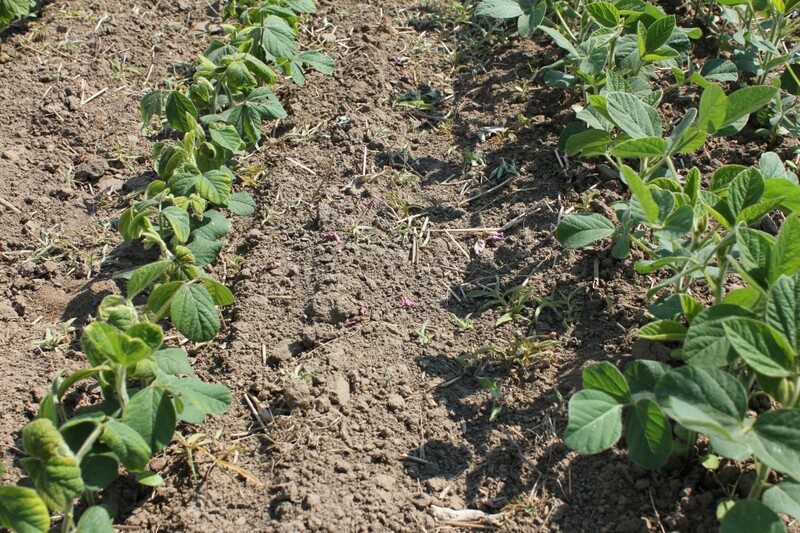 Scenario 5: This is a simple comparison of two post emergent herbicide programs for glyphosate tolerant soybeans, both promoted as having “mulitple modes of action” for “effective weed resistance management”. Lets first compare the crop safety of both programs when applied at the “overlap rate” which is twice the registered field rate. 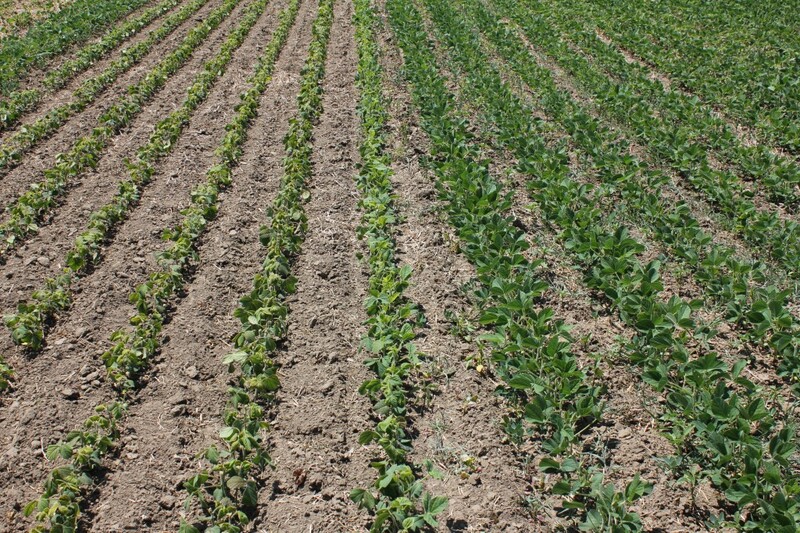 A row of soybean sprayed with Guardian at twice the labelled rate (left) compared to an un-sprayed row (right). 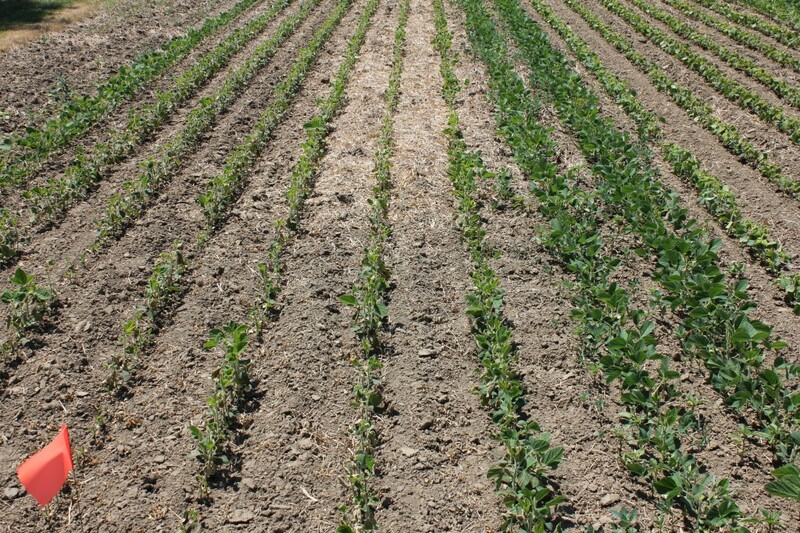 A row of soybean sprayed with an overlap rate (twice the labelled rate) of Flexstar GT. A close up of Flexstar injury. Note the leaf distortion and leaf tissue necrosis (browning) typically caused by a WSSA group 14 herbicide, in this case, fomesafen. New growth is typically unaffected, and injury symptoms dissipate after 14-21 days. Both herbicides will cause some level of crop injury, typically Guardian is more injurious, but due to very dry conditions in 2012, injury appears greater than what normally occurs. I will tackle the value of both for being “effective resistance management tools” in a later post. 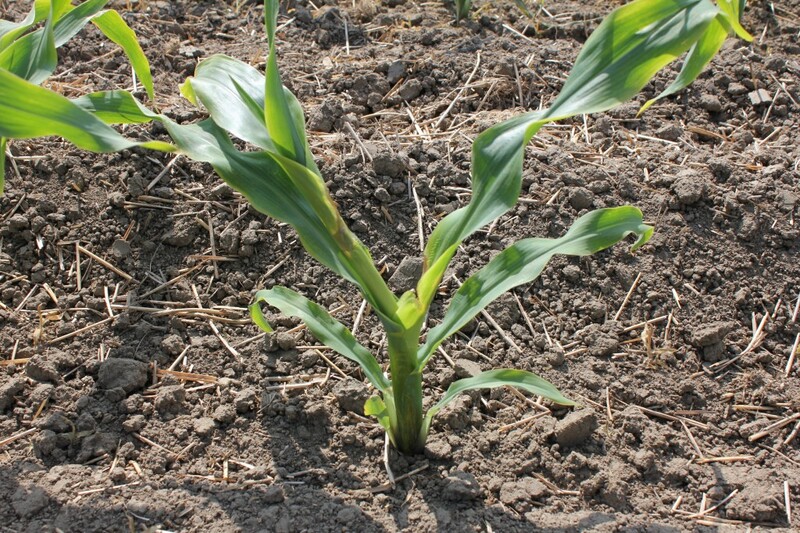 Scenario 6: glyphosate + MCPA in glyphosate tolerant corn. I will refer you to Scenario # 2 in a previous post, as I don’t think I’ll ever be able to duplicate the severity of that injury. 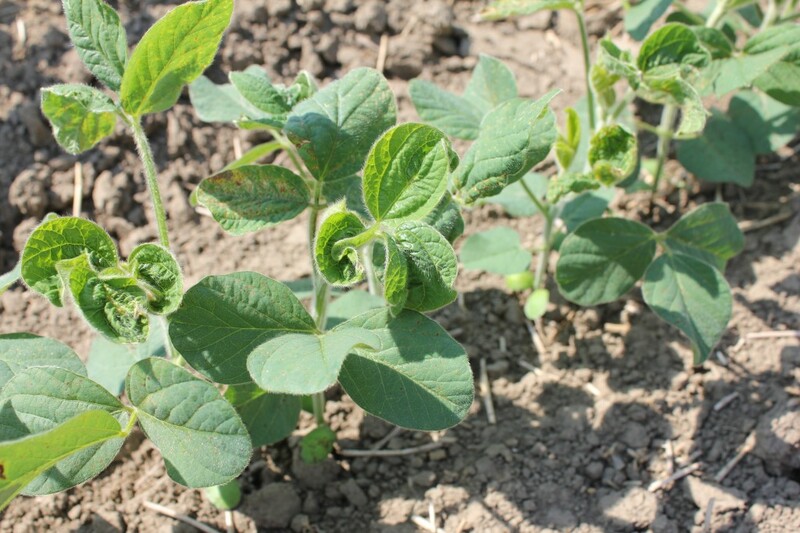 Scenario 7: How herbicide tolerant are herbicide tolerant hybrids? It would appear that some are very tolerant. To recap: when a herbicide is approved for use in a specific crop, it must be demonstrated that it has acceptable crop tolerance if applied at an overlap rate, which is twice the intended rate. The reason for this is quite simple, even with the latest GPS guidance systems, there still will be some level of spray boom overlap. As any experienced applicator or farmer will tell you, “t’is better to have an overlap, then an underlap” (I know, not a word) as the later will always be an ugly weedy mess. 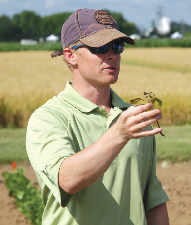 Dr. Peter Sikkema (University of Guelph, Ridgetown Campus) has demonstrated in his research program that even when glyphosate is applied at eight times the labelled rate, corn hyrbid tolerance is still acceptable. 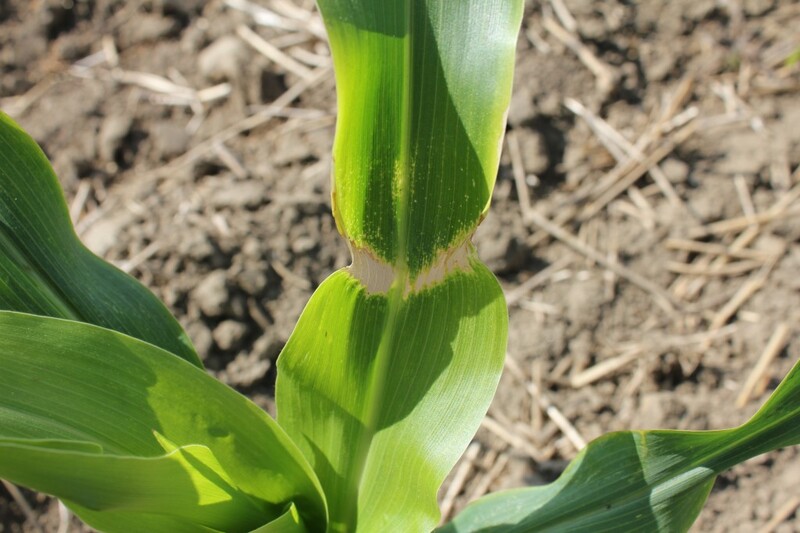 Injury caused by extremely high rates of glyphosate (8X) applied to glyphosate tolerant corn. The impact of high rates of Liberty (glufosinate) applied to Liberty Link corn has not been evaluated in public research trials. Based on this single demonstration trial, comparatively high rates of Liberty appeared more injurious to corn, then high rates of glyphosate. Crop injury as a result of Liberty (glufosinate) applied at 8 times the labelled rate.